"Roger & Staff - Just a note to tell you how pleased I am with your work. Everything came out very nice. The crews were professional and polite. I will recommend your company to anyone I know who is looking to landscape. Thanks again." "We would like to take this opportunity to commend the people who worked on our landscaping. We were also impressed by the brick experts who made our beautiful patio and walkway. 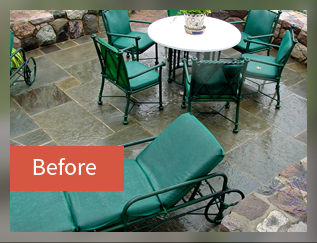 We welcome anyone to see the quality and professional care and design that goes into a Soullliere landscaped home. Roger Soulliere was a concerned and caring designer from start to finish. We were impressed with his desire to see that we were happy and that the job was done right. It is gratifying in today's business world to have someone give you value and satisfaction for your money. We encourage anyone who truly wants a quality job to consider Soulliere." "Just wanted to let you know how pleased we are with the front walk. It is just beautiful. It was a pleasure dealing with everyone representing the company. Soulliere is a very professional organization that we would not hesitate to recommend to anyone. It is really refreshing to deal with anyone concerned with quality." 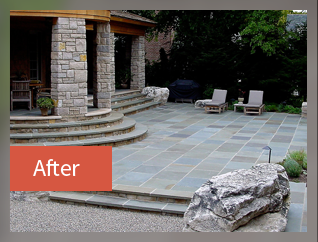 - Keith and Marcia R.
"The guys did a beautiful job on our bluestone. In addition to that, they were very respectful of our property and we hardly knew they were even there. They never even blocked our garages in or prohibited us from getting in or out of our driveway! I can’t tell you how much we appreciated that. We will not hesitate to recommend your company to our friends or family." “I wanted to thank you and your workers for a job well done this past June. The stone work on the front entrance is beautiful and I love the large stone slabs, as they look great at the entrance. The brick work alongside of the house and the re-do on the back patio turned out just the way I had wanted. I am very pleased and have received many compliments from family and friends.